The hot tub free Wi-Fi and I-79 location near outlet shops make the Monroe Heights Hotel worth writing home about. The three-story Monroe Heights Hotel houses 115 rooms featuring kitchenettes and hairdryers. Wi-Fi and national calls are free. Guests can munch on snacks and chill drinks thanks to ice and vending machines. There's also a hot tub for maximum relaxation. On-site parking is free. Pets are allowed. 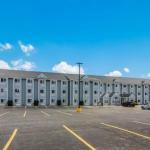 Conveniently set off I-79 and I-80 the Monroe Heights Hotel lands guests next to the Grove City Premium Outlets and less than eight miles southeast of Mercer. A 54-mile drive south leads to Pittsburgh. Corporate guests are within seven miles of General Electric and less than 17 miles from USIS. The hotel's location is five miles west of Wendell August Forge and nine miles north of Moraine State Park. Nearby airports include Youngstown - Warren Regional Airport 37 miles west and Pittsburgh International Airport 67 miles south.